From the documentary "Beats of Freedom"
Over a quarter of a century after the fall of the Communist Bloc, Polish rock bands are still searching for their true identity. 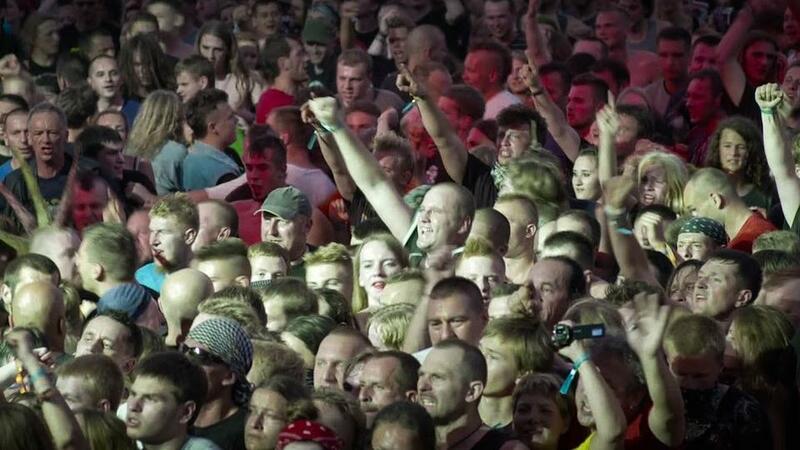 Encouraged by the older generation of musicians, they look to the legendary punk festival that took place in the 1980s in Jarocin. “In those times, Jarocin was like Polish YouTube you could watch live,” comments Darek Dusza, the founder of punk and reggae band Śmierć Kliniczna. “We were singing about love, peace and freedom, to give hope. We were trying to change people with our clothes and lyrics,” remembers Paweł “Guma” Gumol, the leader of punk band Moskwa. “Jarocin was like a small social project – it was a normal society and every city in Poland should’ve looked like it. People should take care of each other and then try to survive together,” adds Marek Piekarczyk, the vocalist of metal band TSA. All these artists are featured in the new film Wolność, po co wolność (Freedom, Why Do You Need That), which celebrates the legend of the Ogólnopolski Przegląd Muzyki Młodej Generacji (All-Polish Review of the Music of the Young Generation) festival, which was for three days at the beginning of each August during the 1980s in the small town of Jarocin near Poznan. The movie, directed by Leszek Gnoiński and Marek Gajczak, follows the long tradition of two cult documentaries about this event – Fala (Wave) by Piotr Łazarkiewicz from 1985 and Moja krew twoja krew (My Blood Your Blood) by Andrzej Kostenko, produced for the BBC. It’s also another attempt in recent years – after films such as Beats of Freedom – to gather famous Polish musicians, representing the generation born in communist times, in front of the camera in order to record their memories of the period when the independent music scene in Poland was just being established. Their stories, told in this latest movie, are in part illustrated with videos from recent festivals in Jarocin and in part with rare archive material from the 1980s. They show hundreds of colourful punks with mohawks, safety pins in their ears, in ripped jeans, well-worn leather jackets and heavy army boots, walking around the city with bottles of cheap wine, sitting on the grass smoking cigarettes, or dancing pogo during concerts. "Freedom, why do you need that?" The video documentation from the festival is substantial, because already in those times, Jarocin represented a fascinating phenomenon in the Eastern Bloc. Officially, it was a competition for young bands that didn’t have access to the media, couldn’t enter the recording studio to make a record, or couldn’t afford to buy professional instruments. Unofficially, it was an oasis of freedom where teenagers from different subcultures could escape the grey, depressive social reality and spend time with their peers, who, like them, didn’t fit into the tight and oppressive political system. In the first scenes of Wolność, po co wolność, you can hear the popular song ‘Po co wolność’ (‘Why Do You Need Freedom’), which is referenced in the title of the movie. It was originally recorded in 1989 by the most famous Polish band Kult, and it was also played again live in Jarocin in 2014. “Freedom, why would you need that? You’ve already got television/Freedom, why would you need that? You’ve already got Intervision, Eurovision/Freedom, why would you need that? You’ve already got so much money/Freedom, why would you need that? You’re gonna have more and more,” asks Kazik Staszewski rhetorically in his lyrics. Almost thirty years later, most of them still sound surprisingly up to date. "It wasn't just about fun"
Later in the movie, there are several more similar combinations of past and present performances – ‘Spytaj milicjanta’ (‘Ask the Policeman’) by Dezerter, ‘Idzie Wojna’ (‘War Is Coming’) by Siekiera, ‘Wolny naród’ (‘Free Nation’) by Izrael, ‘Moja krew’ (‘My Blood’) by Republika and ‘Nigdy (‘Never’) by Moskwa. Not all of the songs stood the test of time, but at least all of the original recordings still make a strong impression. This allowed the directors to shape a clear timeframe for their story of Polish alternative music, and the artists in the interviews could also provide an interesting view of their past from their current perspective. 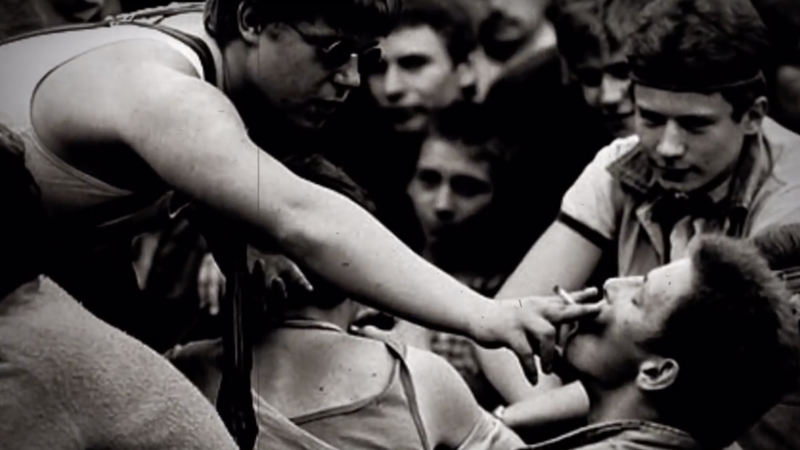 Similar to Fala and Moja Krew Twoja Krew, the film is strongly focused on the development of the punk movement in Poland, with the main aspect of this process being the “need for freedom” – how it was manifested through the appearance and behaviour of the fans and through the music and lyrics of the bands. “For us it wasn’t just about fun, it was the chosen way of life. Do we follow the herd of people who just want to survive, or do we look for our own path?” explains punk songwriter Patyczak. The context to his statement is provided by quick archive footage of everyday life in the communist country, where people paid official respect to their leaders and celebrated Labour Day and Harvest Festival, with adults working hard in factories and offices, and young people going to school in clean uniforms or practicing traditional dances in folk outfits. Attractive pictures of reckless teenagers enjoying their time in Jarocin and the strange memories of the participants stand in stark contrast. They explain how they managed to get around the prohibition by smuggling good weed and cheap alcohol from other cities or by drinking a lot of cough medicine. There were also many DIY methods for a colourful image – one could paint the name of a favourite band on a T-shirt, collect hundreds of studs to wear on the belt, or mix nail polish with ink to get interesting colours. Image from the movie "Beats of Freedom"
“There was this positive virus spreading around and many people were saying: ‘I went there, I saw it, I’ve started my own band,'” says Muniek Staszczyk, leader of pop rock band T.Love. “Suddenly people started believing in themselves, that they could create something, that they could become artists,” adds Darek Malejonek, who played in dozens of bands – Izrael, Kultura, Moskwa, Armia, Houk. All of the artists featured in the film not only had the opportunity to express their teenage anger and went through an uneasy coming-of-age phase in Jarocin, they also made a lifelong decision to become musicians. Unlike typical pop stars in those times, they didn’t know much about music and sometimes didn’t even own instruments. Their access to foreign records was also very limited, so they had to be creative in finding their style. And as the Polish labels were not interested in releasing their music, a distribution network was established according to samizdat principles. Fans holding up portable cassette players recorded the concerts, copied the tapes at home and sent them out by post to other parts of the country. Soon the bands themselves started publishing their own tapes in a similar way, and numerous fanzines were created. This new generation managed to overcome the helplessness and apathy of their parents, with the punk slogan of “no future” motivating them to act, instead of discouraging them. The best editions of the Jarocin festival took place during very turbulent times in Polish history. In the beginning of the 1980s, the economy of the Polish People’s Republic was slowing down, the foreign debt was growing, the basic supplies in stores were running out, and the prices of food were rising, until the social dissatisfaction finally led to labour protests and strike action all over the country, supervised by the Solidarity trade union. Unfortunately, the regime responded by declaring declared martial law in Poland. The army, together with special police forces, violently pacified the opposition and arrested all of its leaders. Although the state of emergency was eventually suspended and the dissidents were released, the most influential political activists were still under surveillance and had to act in secrecy. That is why recent discussions about the significance of the Jarocin festival for Polish music and history usually raise two complicated questions. First, how was it possible that such an event could even take place and was allowed by the regime? 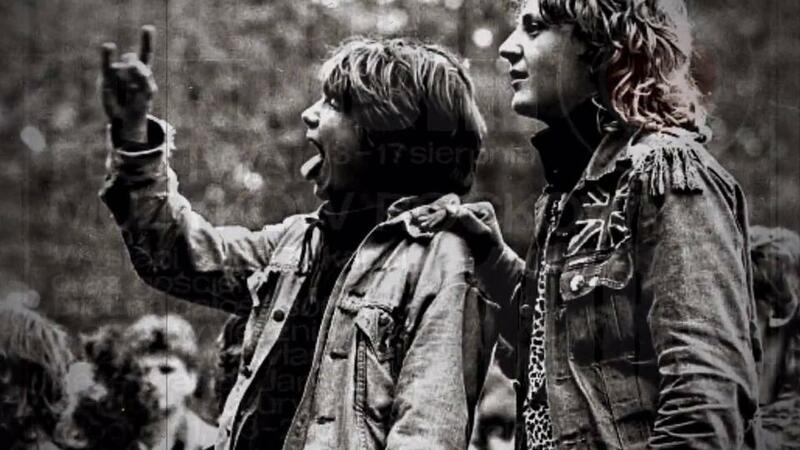 The second issue is even more complex and concerns the connection between the punk movement and the opposition, as well as the role of musicians in restoring freedom in Poland. "This music changed their lives"
Nonetheless, censorship was present at the festival and the artists had to submit their lyrics for inspection before going on the stage. Especially in the mid-1980s, control was very strict. If certain words seemed suspicious, they were deleted or the entire song was forbidden. Artists responded with clever ways to avoid censorship by using metaphors, for example the reggae band Izrael, which replaced “political system” with “Babylon”. 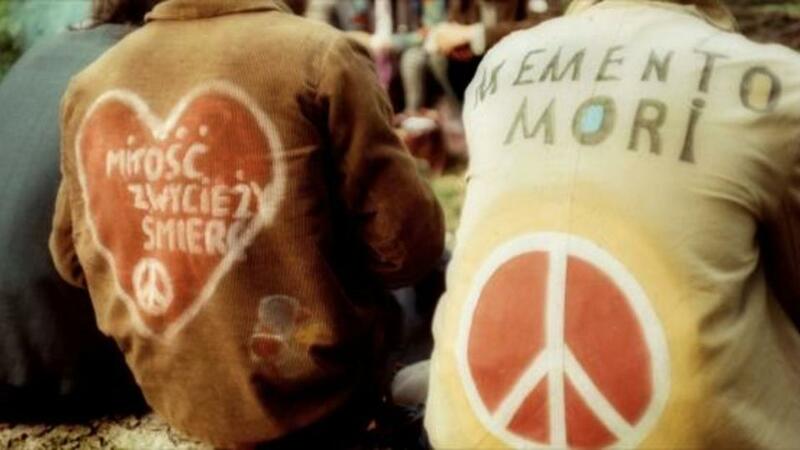 Although the participants of Jarocin Festival and the members of Solidarity shared a similar attitude towards the communist regime, they didn’t fight hand in hand. There were too many differences between them – members of the young generation were rebelling against the older ones, they didn’t want to follow in their footsteps but live their life, they looked different, talked different, shared different values and had different dreams. This clash of worlds is depicted when the band Sztywny Pal Azji performs a guerrilla concert for workers leaving the furniture factory. Musicians were creating their own community, not workers’ unions, writing lyrics and trying to raise listeners’ spirits, while the opposition was formulating demands and negotiating directly with the regime. “There was no time for a real rebellion, with great leaders, mass revolution, colourful banners. The whole process was transported inside people, this revolutionary change had to happen within the people themselves,” explains Paweł “Kelner” Rozwadowski, founder of the bands Deuter and Izrael. “We were singing that the nation needs to be free and the people were moved. This message reached their hearts and they felt motivated to change and move forward. Even today we meet people who were in Jarocin and this music changed their lives,” explains Darek Malejonek. The story, as it is told in Wolność, po co wolność, sounds exciting, especially nowadays, but in the end, it leads to mixed emotions. It builds the myth of Jarocin as a historic founding place of Polish music, with the old generation of musicians becoming brave romantic heroes like the most famous protagonists of classic Polish literature. However, just a few years after the fall of communism in Poland, the festival started losing its popularity, then was sponsored by a big tobacco company, and finally, the last edition in the mid-1990s ended with riots in the streets and clashes with the police. The festival was suspended for over a decade. In the meantime, other open air events started talking to a new generations of fans, more open to different styles of music and different culture from abroad. In this new reality, Jarocin was relaunched as more of a nostalgic event, bringing old legends back onstage and paying tribute to the spirit of the past. Recently, in honour of the legendary participants of the festival, the city founded the first Polish music museum, Spichlerz Polskiego Rocka (Polish Rock Granary), while Jarocin Festival has become just another international summer rock festival. During the filmed interviews, some of the performers find this development quite ironic or even funny – that every year these same bands are invited to play their old songs, with the only difference being that old fans now bring their whole families with them. Others express their disappointment, because right now music is so easy to access everywhere, it doesn’t hold any serious value for the audience and artists don’t try to come across with any significant message. Due to these unfulfilled expectations, the true identity of the Polish rock music right now seems to be a bit lost. Older artists didn’t want to evolve their sound according to the times and their music has become obsolete, although there are still a few successful bands, such as Kult or T.Love. Meanwhile, younger artists haven’t experienced living under communism, so they don’t feel much connection with the style and lyrics of bands from the 1980s. Instead of continuing their legacy, they’d rather look for inspiration abroad and explore the music that their forefathers weren’t familiar with.